The components inside of your Maytag refrigerator do not last forever, including the filters, hoses and other parts. Certain parts require an authorized refrigerator repairman to complete the parts installation. Like other refrigerators, your Maytag contains a light bulb that eventually burns out. The bulb is available at hardware and home improvement stores as well as online. You can change the light bulb yourself. By replacing the bulb yourself, you avoid the hassle of having to schedule a repairman and paying for the service call. It is not hard to replace your Maytag refrigerator's light bulb. Unplug your Maytag refrigerator's power cord. 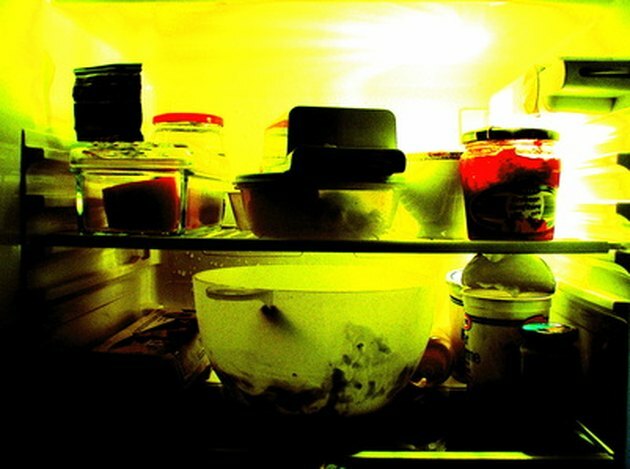 Use a flashlight to locate the light bulb cover on one of the sides inside of your refrigerator. Squeeze in on the clips on the side of cover to free it from your refrigerator's wall. Place the cover to the side. Turn the light bulb counterclockwise to unscrew it from its holder. Take the light bulb to a hardware or home improvement store to match it with a new one of the same wattage. Place the new light bulb in its holder. Turn it clockwise to screw it into its holder. Snap the light bulb cover back into the tracks on the refrigerator's wall. Plug in your Maytag refrigerator's power cord and open the refrigerator's door. The light will illuminate immediately.